IFBB fitness competition is in large degree a gymnastics contest for women with athletic bodies. This is becoming more the case since the federation is cutting back on the allowable muscle in fitness, just as it is attempting to do with female bodybuilding. This being the case, once Kelly Ryan performed her routine it was almost a certainty that she would win the Fitness International. On a stage full of gymnasts, her routine stood out - as you might expect from a former student of the legendary Bela Karolyi. It also helped that Kelly had improved her physique over the past year or so, in part due to the coaching of Craig Titus. I noticed her increased muscular development a few weeks before the contest when I photographed her in my studio (that session is available in the subscriber's section of the site). Kelly is a long way from looking like a competitive bodybuilder, but she now has enough development and definition so as not to be confused with the "fitness models" we are seeing so often in the physique magazines. While Kelly was improving her physique, Timea Majorova - who doesn't have the same gymnastics background but who does have one of the best and most aesthetic physiques in fitness - has been working hard on her performance skills. Her routine was excellent, although not one of the very best. At the same time, Timea was somewhat smaller and less muscular than in the immediate past, in conformation to the dictates of the IFBB no doubt. 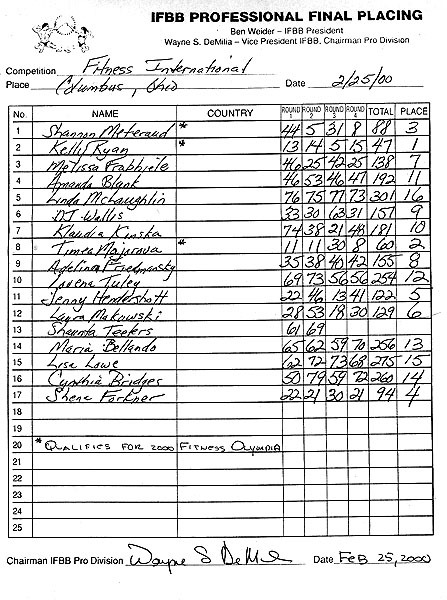 Interestingly, when she first entered pro competitions Timea was consider too muscular, but when she subsequently got smaller and smoother she began being overlooked entirely. It was only when she gained some muscle back that she began receiving higher placings from the judges. At the size she was in Columbus, the judges seemed to feel that Timea fit the current criteria, although to fans of women's physique her relatively lack of muscularity made her seem somewhat less interesting.